Findmypast's British in India collection contains over 2.5 million records detailing the lives of your ancestors in India from 1698 to 1947. The collection, released in partnership with the British Library, offers an unrivalled opportunity to explore family history on the subcontinent. The records cast light on the careers and family lives of expats, the significance of the East India Company, the offices of power, infant mortality, Anglo Indian marriages, family relationships, and the lives of women in India. The details of expats' lives and deaths are documented in a variety of records ranging from returns of baptisms, marriages and burials, civil and military pensions and wills. 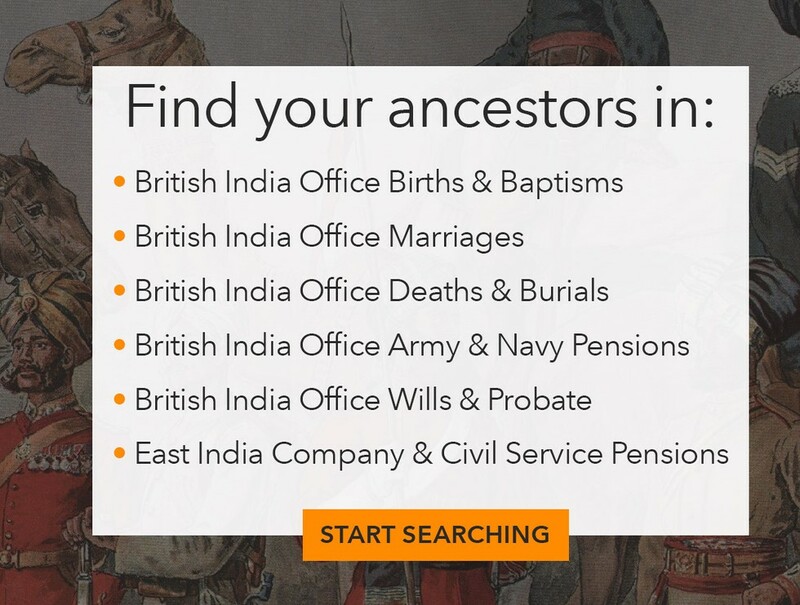 @findmypast The #BritishinIndia records are brilliant! So much useful information in there. Great fun when it is too wet to go out. Combine this fascinating British Library collection with our other records documenting the British and Irish in India and you'll be able to piece together your family's time there over generations. Go to A-Z of records and type 'India' now to see what other record sets are available to search.